It makes for an interesting comparison, this film and the one I posted about before, The Life & Death of Colonel Blimp. Both are British films concerning the Second World War, and made during that period. In Which We Serve (1942), released a year earlier, was the golden child, showered with a large expense account and all manner of advise and logistical support from the British armed forces. The reason is easy to see, it's plainly a propaganda film, one that exclusively celebrates the chivalry, selflessness and gentlemanly spirit of the British forces fighting the war, and the brave front put up by their loved ones back home. The enemy is always seen from a distance, a nameless warship or attack plane; for all this film cares, they might have been piloted by robots wearing horned Hitler masks. Where Col. Blimp differs is in giving a face to the enemy, suggesting that they too are honorable and courageous soldiers, and in implying that the days of battles being conducted as by-the-rules games of cricket are over. For this, the makers were strongly "advised" by the script-censors not to make the film, and denied all forms of official support. Winston Churchill himself did his damnedest to block its release. It was only several decades later, thanks to the efforts of cinema champions like Martin Scorsese, that the world got to see the intended version of Powell and Pressburger's wartime classic. Anyway, we're talking here about In Which We Serve. While it is a propaganda film, that doesn't by any means make it a bad one. It was the brain-child of the versatile and immensely successful artist Noel Coward. Coward was a patriot and wanted desperately to do something to aid the British effort in the War. When the producers came to him with the offer of funding any script he had in mind for a movie, the normally film-averse Coward translated into an engaging screenplay the wartime experience of his friend Lord Louis Mountbatten, who captained the destroyer ship HMS Kelly before it was sunk by the Germans. The lead character, played by Coward himself (and rather well, exuding the requisite quiet authority), is based on Mountbatten (and Coward wore Mountbatten's cap for many scenes), although modified to avoid direct comparison on the man's request. Coward's search for someone to "help him with the technical side of things" led to his discovery through a mutual acquaintance of David Lean, then an editor. Lean accepted the job on condition that he share directing credits with Coward. What is therefore most remarkable about In Which We Serve is that it is the feature film debut of both Coward and Lean. To start your film career on a large budget war epic with massive logistical challenges could not have been easy, but the final product looks remarkably assured. The film starts with the sinking of the destroyer HMS Torrin (a fictional stand-in for the Kelly), helmed by Capt. Kinross (Noel Coward). The surviving crew huddle around an inflatable raft, and as we focus on each of them, we enter a flashback that looks at their life, their relationships with their military colleagues and their family members. It's a somewhat clumsy structure, but allows for a variety of experiences as we get an inside view into a cross-section of characters from the clipped-tongued captain to the East End sailor. Uniformly, they focus on presenting a charming warm-hearted picture of regular patriots, with loving supportive families, so it's not as realistic (or cynical, if you so regard) as the war films of successive decades would be, but it does its job as a rouser of public feeling in a skillful and sincere manner. Especially touching is the depiction of the families. The characterization is simple but there is nuance in the evoking of social strata and in the performances. 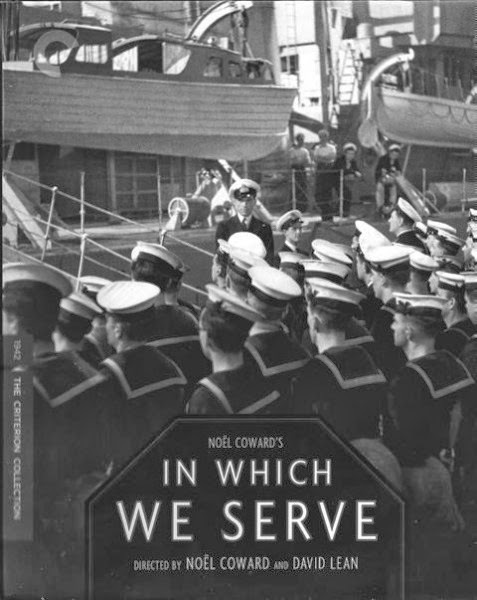 Easily the best of these is Celia Johnson as Mrs. Kinross, who belies her cinematic debut with a well-anchored performance, exemplified in the lovely single-take scene where she extemporizes on her feelings towards the "rival" of all naval wives, their spouses' ships. On the technical side, Ronald Neame, a regular DoP on the Coward-Lean partnerships, does a sterling job of capturing the vision of the directors. The lensing is not flashy, but solid and effective, with great contrast. The scenes of on-ship battle look quite convincing in comparison to other films of a similar period. On the whole this is a very well accomplished rah-rah patriotic film that manages to rouse without appearing fake or grating. Criterion's blu-ray of this film, part of a set of Coward-Lean films, gives an excellent visual presentation, showcasing deep contrast and fine detail. The mono sound is limited by its source, but clear and free of distortions. A fair number of extras, including a Coward biographer talking about the film and a making-of documentary with interviews from several sources, including Ronald Neame.